Cyprus the largest island in the Mediterranian, lies just south of Turkey in the Mediterranean and has for a long time attracted tourists to it's beaches and sights, having myths and history dating back thousands of years, with many well preserved Roman ruins. 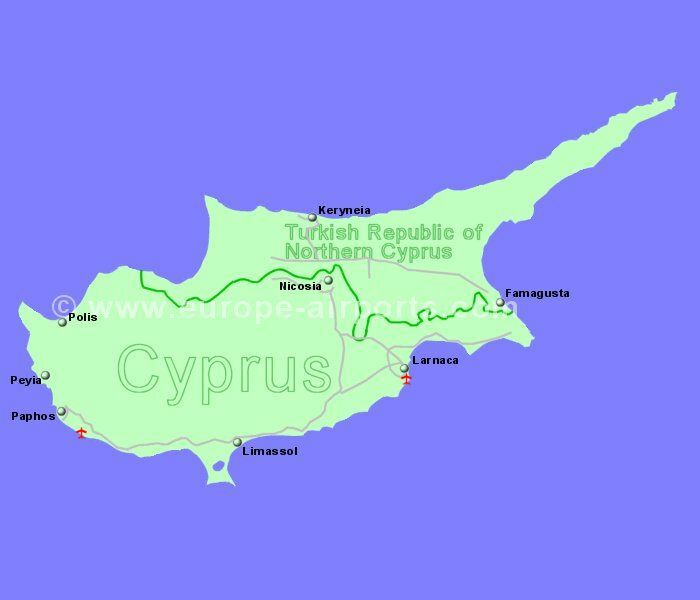 The country (which was previously a British Colony) is officially known as the Republic of Cyprus but the northern part is controlled by Turkey and known as the Turkish Republic of Northern Cyprus (only recognised by Turkey). We have included airports from the whole of Cyprus here. While Greek and Turkish are the official languages, you will find English widley spoken together with French and German in the tourist areas of Cyprus. The Republic of Cyprus is a member of the European Union using the Euro currency, and is also a Schengen country. The Turkish Republic of Northern Cyprus is not a member of the EU or Schengen, and the currency is the Turkish Lira (TRY). Located 5Km south of Larnaca, south east Cyprus. The largest of the two commercial airports in Cyprus and the main gateway to the island. Located 16Km south east of Pafos, south west Cyprus. The city of Paphos is itself a tourist destination, being included in the official UNESCO list of cultural and natural treasures of the world heritage.